If you have US $1 million at your disposal and want to invest in luxury real estate abroad, what could you buy? London-based real estate brokerage Knight Frank recently again released The Wealth Report, or Prime International Residential Index (PIRI 100) to compare how much prime property you could realistically buy all around the world for US$1 million (roughly AUS$1,353,500), and it turns out that the size of the property you’d like to buy often has precious little to do with its price – it really depends on how much you’re willing to pay for space. The report says that 2017 was a year with relatively healthy growth across most markets, with most big global cities becoming more expensive over the past year. Monaco comes out on top as the most expensive city in the world for the seventh year running, with US$1 million buying just 16 square metres, which, for comparison, is about the size of a walk-in closet. Unless you are the Dursleys, Harry Potter’s horrible aunt and uncle, and you are looking for a (very expensive) place to have your wizard nephew stay, you would be better off looking at luxury real estate in emerging markets like Cape Town in South Africa or São Paulo in Brazil, where US$1 million will get you 157 square metres and 173 square metres respectively. Sydney is the eighth-most expensive property market in the world – US$1 million will buy you 48 square metres of prime real estate here, while Melbourne comes in at number 15, with 90 square metres for US$1 million. According to the Prime International Residential Index, these were the most expensive cities to buy luxury property in 2017. 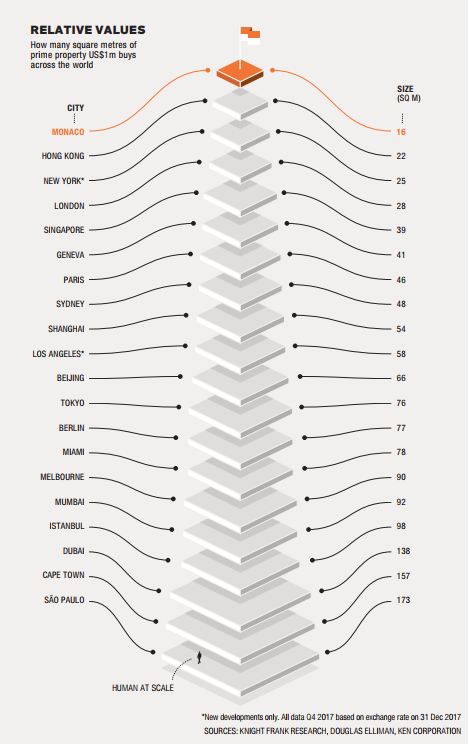 Knight Frank’s Prime International Residential Index is based on the performance of the luxury real estate market globally and geographically, and takes into account where the super-wealthy are investing their money in property. This helps to gauge the state of a location in terms of its property market cycle, and paints a picture of the value offered by key global residential markets in relation to one another. It is important to remember that this index relates specifically to luxury properties, although it can provide insight into the global property market and the state of global markets. When Knight Frank released The Wealth Report in the first half of 2017, they made predictions about global cities that were showing the highest growth in property prices. Not surprisingly, the tops spots belonged to three Chinese cities: Guangzhou (number 3), Beijing (number 2) and Shanghai (number 1) showed the highest growth in property prices, with growth of 26.6%, 26.8% and 27.4% respectively. The growth of the Chinese economy, together with soaring demand for housing due to these cities being hubs of industry and commerce is given as the reason for the growth of the property market in China, and this trend is expected to continue as China’s economy strengthens further. Sydney in Australia showed property market growth of 9.3% when Knight Frank published their 2017 report, and was described as a “destination for the footloose wealthy”, where the rise in the price of prime properties also leads to higher prices all round. With Sydney coming in at number 11, Melbourne was just a little behind with property market growth of 8.8% in 2017 and the number 12 spot on Knight Frank’s list for the highest growth in 2016. The report cited that the significant transformation that Melbourne has undergone in the past decade has lead to it being considered a more attractive place to live, and while there are indications that Melbourne’s population may surpass that of Sydney’s by 2036, the demand for housing looks to continue. It is interesting to note that Sydney moved up in the PIRI 100 rankings in 2017, rising to number 8 from number 10. Melbourne also moved up to number 15 in the 2017 report from number 17 in the 2016 report, with US$1 million buying you 90 square metres of property instead of 2016’s 110 square metres. There seems to be some consistency in the cities that feature on Knight Frank’s PIRI 100 list, and while it may look like the very wealthy are paying more and more for a postage stamp, as opposed to a palace, it will be interesting to see what the report about 2018 holds, especially for as far as the Australian big guns go.